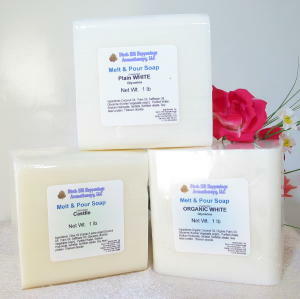 IF YOU DON'T need Perfect 1lb Blocks of M & P Soaps - CLICK HERE for our Seconds of M & P Soaps that are deeply discounted, while supplies last. These 1 lb blocks can be cut in to smaller pieces using a large cheese block cutter. Or as is usually done, they can be melted in a double boiler or slowly melted in a microwave to be poured into any number of soap mold shapes! Easy to follow instructions included with each order. Can be scented using essential oils if desired. For scent sensitive people, just leave unscented. SCENTING: It is suggested to use between 2 mL to 10 mL of essential oils per 1 lb of melted M & P soap to scent. ALWAYS start with the smaller amount as you can always "add more (scenting) but you can't take it out"! As with any soap - an inherent odor is present due to the ingredients used to make the product. I have been using this soap for three years now. I scent it for different family members and everyone loves it. The soap is clean, leaves no scummy residue on your skin or the tub. Can't recommend it enough. Always on the lookout for a good clean, environmentally friendly soap. I have found the M&P Cocoa Butter to fit the bill. I made about 20 bars of soap for family this holiday season and added various scents. They were a hit. I will not buy soap for myself anywhere else. These are great soap bases. They are easy to work with and my family and friends love the results. I've been able to give really creative and personalized gifts all year for a lot lower cost than I expected.